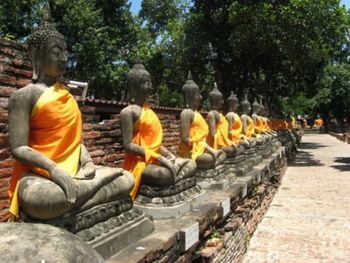 Buddhism was introduced into Thailand from Sri Lanka, and currently nearly 95% of the population is Buddhist. Theravada is the predominent school, though beliefs are often mixed with folk religions. Mahayana Buddhism is also practiced in Thailand, though it is mostly confined to Thais of Chinese ancestry. Since the 60s, many foreigners have trained at monasteries in Thailand, and while most have only stayed for a short time, many have also taken monastic ordination. Therefore, it is not uncommon to see farang(foreigners) monks at monasteries, especially those located in rural areas in the north and north-east of Thailand. Two famous Thai monks who have enjoyed influence overseas are Ajahn Chah and Buddhadasa Bikkhu. Never sit with the soles of your feet facing a Buddha image or a Buddhist monk. The feet are considered dirty, and so it is considered disrespectful to sit with them facing an object of respect. Women should never touch a Buddhist monk. If a female wishes to make an offering to a monk, she should place it on a table and allow the monk to retrieve from there. Do not climb on sacred objects and do not hug Buddha statues. Do not take photographs of meditating monks as this obviously disturbs their practice. Below is a list of monasteries that offer meditation courses for non-Thai speakers. NB: This list serves only as a 'pointer,' and more detailed information is available on the city or province article where the temple is located. Wat Pah Nanachat (WPN) The International Forest Monastery, Ban Bung Wai, Amper Warin (12 kms from Ubon Ratchathani). .
Wat Umong, Tambon Suthep, Amphoe Muang (3 and a half miles from Chiang Mai) , .